Judicial engagement with China on IP issues has frequently had a markedly different tenor from other forms of engagement, such as executive branch, business, or academic. Judges carry less political baggage than does executive branch of the government, may be more direct, and can also be more inclined to be more balanced in their approach, as they reflect upon the kinds of controversies they encounter every day in their courtroom. Most important of all, in judicial encounters with China, judges can also tend to highlight the respect that American society has for the judiciary, in their independence granted by the constitutional guarantees in their salary, their freedom from political interference and their ability to make law. Some judges, such as those of Chinese descent, also help in showing how America strives to be a fair and open system. In the IP area, the U.S. has been fortunate to have several judges who have played an active role over the years. Amongst them, Chief Judge Randall Rader, of the Court of Appeals for the Federal Circuit, has probably had the most extensive engagement of any US judicial official with his frequent high level visits, academic, media and judicial engagements, and gracious hosting of Chinese guests at his court in Washington, DC. Chief Judge Rader is planning a major judicial conference at the end of May this year on patent adjudication, which I am helping to organize, which will also cover a number of technical and broader issues, including the importance of international coherence in the IP system – and about which I will speak in another post. Currently there are 910 federal judges, of whom 14 are Asian Americans. Judge Chin is the first and only Asian American to sit on the Circuit Courts outside of the Ninth Circuit. Judge Ronald Lew, now on senior status, at Central District of California in the Ninth Circuit, has also been actively engaged on Chinese IP matters, and has spent time as a visitor lecturer at the IP School of Renmin University and lecturing throughout China, but especially in his native Guangdong Province. Both Judges Lew and Chin are from Toisan (Taishan) in Guangdong Province, and both came from humble beginnings in the United States. Judge Chin is a native of Hells Kitchen, New York City – what was once a very tough neighborhood, and a graduate of Stuyvesant High School, Princeton and Fordham Law School. A few weeks ago, Judge Denny Chin, accompanied by a delegation from Fordham Law School, went on a tour of China – his first time back since he immigrated to the United States with his family over 50 years ago (some in his family had lived in the US previously, but had been subject to the Alien Exclusion Act, making family unity impossible). In the US media, some have noted that Judge Chin would be a credible candidate for the first Asian-American nomination to the Supreme Court. As he had previously been confirmed 98-0 by the Senate, he might also be more easily confirmed than many others. By contrast, some in the Chinese media had compared him to another famous Chinese American – Jeremy Lin of the NBA. Though Judge Chin is known to be a ferocious rebounder on the courts himself , both Chin and Lin represent symbols of rare breakthrough in two unlikely professions for Chinese in the mainland. During this recent homecoming to China, Judge Chin spoke at several IP-related events including a well-attended IP and innovation program at AmCham China (the papers and a podcast are still available on line), Renmin University, and several universities in Beijing, Shanghai and Hong Kong Kong. He also met with a range of Chinese judges, including Chief Judge Kong Xiangjun from the Supreme People’s Court, as well as Judges Xia and Zhu from that court. Judge Chin noted that IP-related cases account for almost 5% of New York court’s docket. Over the course of 18 years on the bench, first as a trial court judge in the Southern District of New York, then as an appeals court judge in the second circuit, Judge Chin, a general Article III Judge, has ruled on many IP cases – notable and mundane, including the class action suit against Google’s proposed ebook project and settlement with authors and publishers. He offered a marked contrast with China’s specialized IP judiciary in describing the challenges of adjudicating complex patent matters, as well as the manner in which his more general judicial experience helped inform his adjudication of cases and its comparative advantages and disadvantages. Judge Chin ruled against a proposed settlement in the recent Google e-book matter, with consideration to the international impact of the case. 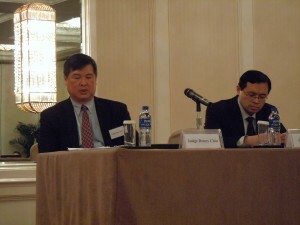 Of the many issues discussed in the ruling, Judge Chin focused on the international impact of the proposed settlement. The proposed settlement drew opposition from France and Germany, as well as many authors and publishers from countries such as Austria, Belgium, India, Israel, Italy, Japan, New Zealand, Spain, Sweden, Switzerland, and the United Kingdom. Authors Guild v. Google, Inc., 770 F. Supp. 2d 666, 684 (S.D.N.Y. 2011). Google contended that this would only be an issue of United States copyright. However, the original settlement would have included any book subject to a U.S. copyright interest. The contested issue in the settlement over orphan books has received differing treatment in different countries, Google’s proposal would essentially reward itself a compulsory license without notice or consent. Judge Chin, taking notice of these and other arguments, concluded that the agreement is not fair, adequate, and reasonable. The Google case rounded out Judge Chin’s 15 year career in the District Court, along with his sentencing of Bernie Madoff, which he also spoke about at length in China. Judge Chin will discuss his perspective on IP-related issues, including in the on-line environment as a Federal Appellate judge on the April 11th program on China’s New IP Environment at Fordham, along with Chief Judge Rader and Judge Zhu Li from China’s Supreme Peoples Court. This entry was posted in China IPR and tagged AmCham, Authors Guild, China's New IP Environment, Court of Appeals for the Federal Circuit, Denny Chin, FBCA, Federal Bar Circuit Association, Fordham Law School, Google ebooks settlement, Jeremy Lin, Judge Chin, Judge Rader, Judicial engagement, Kong XiangJun, Ninth Circuit, Renmin University, Ronald Lew, SDNY, Second Circuit, SPC, Zhu Li. Here’s some more background to Judge Chin: http://law.fordham.edu/34428.htm.